"Firefox plug-in to control your favourite music player"
If you listen to music while surfing the Internet with the Firefox browser, this plug-in might be interesting for you. FoxyTunes will allow you control almost any media player and find lyrics, covers, videos and more without leaving your browser. 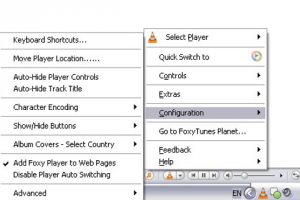 FoxyTunes comes with an easy-to-use interface that is highly customizable. Many players are supported, to name a few: iTunes, Winamp, XMPlay, RealPlayer and Last.fm, among others. Music discovery has never been made that easy now that searches for lyrics and album art make use of FoxyTunes' own music portal, providing feeds from Google, YouTube, Wikipedia, Amazon, Last.fm,, and various online radio stations. In this version there's added support for Yahoo! Updates, this means it is now possible to share information about what you are listening to with your Yahoo contacts.